Auroville is a small intentional community in South India with a population of around 2000 people. It started out as a utopian experiment in 1973 and today is a small close knit community engaging in sustainable practices. Like all other utopias that were celebrated around the same time, the vision for Auroville was dictated by a single individual. Auroville adheres to the larger universal ideal of utopia – non ownership of land, abolition of the power of money, centralized dining hall, rotational community work to avoid boredom, unending education etc, yet there are certain intricacies that are unique to this intentional community. 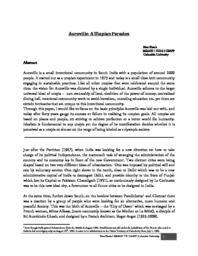 Through this paper, I would like to focus on the basic principles Auroville was laid out with, and today after forty years gauge its success or failure in realizing its Utopian goals. All utopias are based on places and people, on striving to achieve perfection or a better world for humanity. Idealism is fundamental to any utopia yet the degree of its manifestation decides whether it is perceived as a utopia or almost on the verge of being labeled as a dystopic society.